Defining traffic filters help you to get leads you're interested in without defining custom feeds. An important thing to understand: what's the difference between custom feeds and traffic filters? 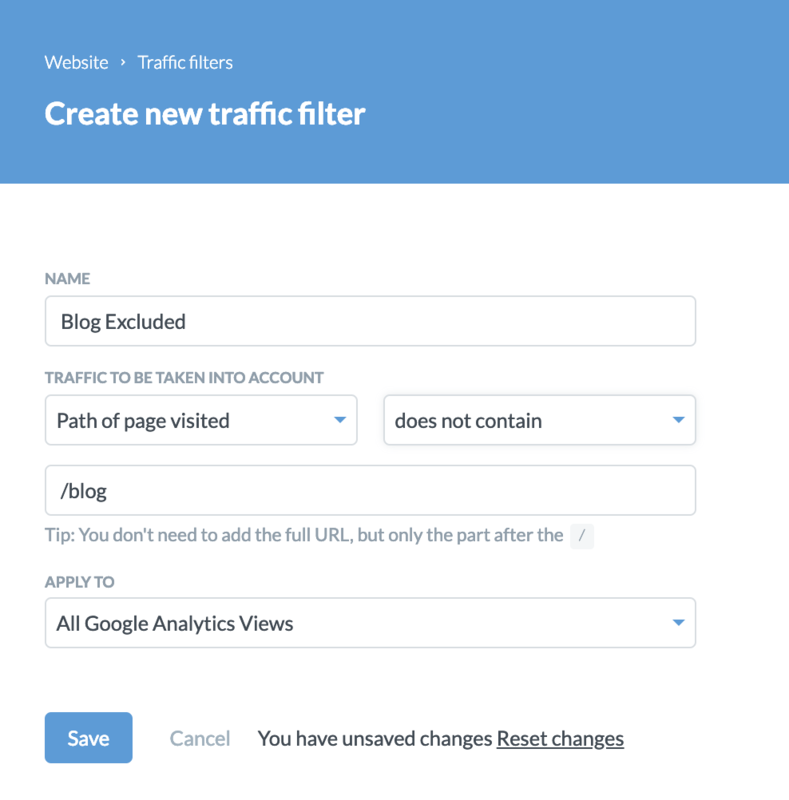 Traffic filters filter the traffic coming from Google Analytics to your Leadfeeder. Leadfeeder will load only pageviews that meet all filters specified for your GA views. Filters will only be applied to future visits. 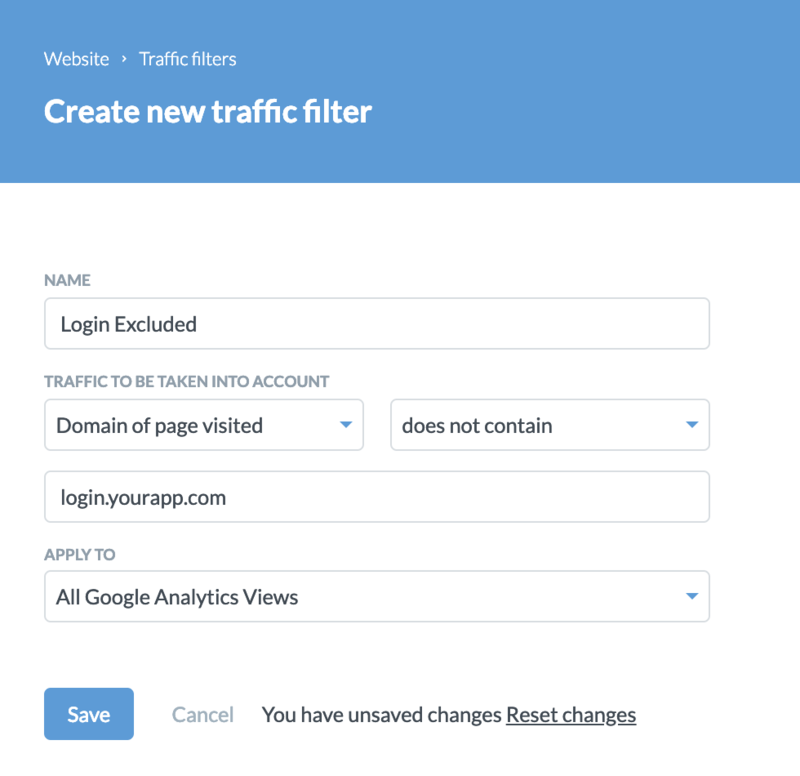 Go to your settings and find Traffic filters under the tab Website. Add a new filter by clicking the button. NOTE: for all applied filters you can specify which connected Google Analytics views are affected. The filtering options are country, page URL and domain. The country filter includes/excludes visits from a specific country. 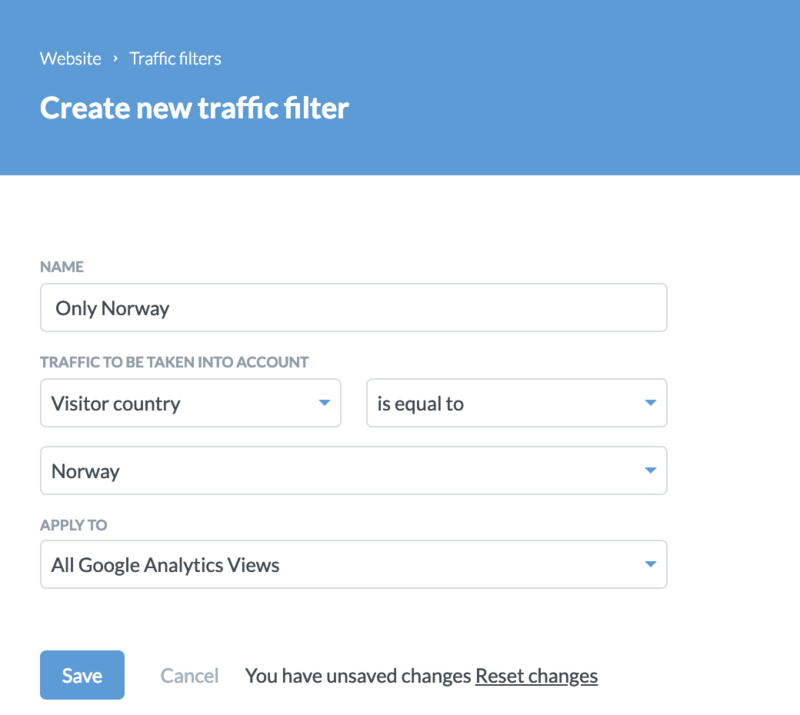 An example of a country filter including only visits from Norway. The Page URL filter allows you to include only certain pageviews. If the lead only viewed only one page during their visit and that was page's URL contained "/blog", then the whole visit will be not shown. Then again, if the lead viewed “pricing” page and “blog” page during the same visit, then after the filtering, the company’s visit would only include viewing “pricing” page. This is because the Page URL filter works on the pageview level, not on the visit level itself. Domain filter allows you to include visits only to relevant domains within pages your Google Analytics tracks. An example of a domain filter excluding visits to the domain where your existing customers login. Once you've set up the filters, they'll show up as in the example below. Please notice that within filter category filters apply operator OR - e.g. Country is equal to Norway OR Country is equal to Sweden. Pushing the button will give you something like: "Estimated total visits in last 30 days: 1223 | after applying filters: 1174 (95,99% of total)"
NOTE: Please notice that filters only apply to future visits. Since a number of visits will be decreased, it also affects your amount of monthly leads in the future.